The Panasonic MC-CL945 Plush Pro is a full sized canister vacuum with a quiet yet powerful motor. You can easily carry it around the home which is important if you have multiple levels to clean and storage is easy as it has a compact design. Their Plush Pro model is the right choice for just about any carpet and it even works well on hard floors like tile, linoleum, and wood. Canister vacuums aren’t typically recommended for high pile or thick carpeting but the MC-CL945 is not your typical offering. It has several key features that make it one of the best choices. Thick carpets are cleaned with very little effort. There are dual vents strategically placed on top of the nozzle that automatically open and close. This provides more airflow at the surface to help keep the cleaner moving and to also help agitate embedded dirt particles. Panasonic also designed their ‘Zero Turning Radius’ design that makes it easy to move the machine around your furniture or other items. Canisters can be a little tough to maneuver and they have a tendency to tip as they turn, but this Panasonic spins with little effort. The stout 12 amp motor is built with their JetForce technology which separates dirt from the air as it passes through, before it reaches the filters. The debris then is forced down to the bottom of the collection bin where it sits during use. This not only keeps the filter cleaner but it also lessens the chance of clogging which is the main reason a bagless vacuum will lose suction power. If you want a total household cleaning machine then having constant, steady power is a must and the Panasonic delivers on this. It should be quite apparent by now that the Plush Pro is great for all types of carpets, from area rugs all the way up to the plushest wall to wall surfaces. The power nozzle with their Air Infusion™ technology draws air through the opening while simultaneously channeling a powerful stream of air back through the brushbar to help agitate and loosen up embedded dust particles. This makes it much easier for the vacuum to pull everything up from the deepest of carpet fibers. Turn the brushroll off for smooth surfaces and then use the pedal to lower the power nozzle down to the best height. While the nozzle and head is quite heavy, the self propelled feature helps you keep it moving along without much effort. The weight can be more noticeable when vacuuming stairs but you can attach a lighter air turbine tool to handle most dirt that is tracked on them. This attachment may struggle a little with embedded pet hair but with some work you can still remove this as well. Since this canister vacuum cleaner doesn’t require bags you want a way to quickly empty the dirt cup without touching the dust particles at all. Panasonic made this possible by adding a push button release that drops the bottom out, making the process very simple and hygienic. You can also periodically wash the cup to keep it in like new condition. This eliminates the buildup of allergens like dust mites and dander which everyone knows can cause problems, especially in people with allergies. Keeping the machine clean will help performance as well as improve the indoor air quality of your home. For those homes with one or more pets, the MC-CL945 Plush Pro has a couple features to help keep your floors and other items clean. The double roller gliding brush is designed to pull embedded pet hair from any surface including stairs and furniture without any clogging. This is perfect for long haired dogs and cats that tend to shed all over your house. A high quality, long lasting HEPA filter is purposely designed to trap the smallest of particles that other filters simply cannot. These microscopic organisms can cause allergic reactions and trigger asthma so it is recommended to have a vacuum outfitted with this type of filtration. And should you have animals living indoors, a HEPA filter becomes a must have feature of any new brand you are buying. Fortunately, the MC-CL945 comes with a highly rated filter. For a canister vacuum, the MC-CL945 has a short wheel base to go with larger rear wheels that actually pivot when needed. This gives it 360 degrees of turning ability for moving around the various items in your home. You can take corners without damaging walls so you can focus all of your attention on cleaning your floors. This is especially handy when using the somewhat heavy power nozzle. Since you won’t be only cleaning your carpets and hard floors, having several on-board attachments is a must. Panasonic included a telescoping wand to reach high and low, and a crevice tool designed to fit in tight spaces. You can gently clean your curtains, lampshades, and blankets with the included dusting brush. Plus a retractable power cord lets you neatly pack it up for storage when not in use. The transition from one type of floor to another is made easier with the height selector on the power nozzle. There are various carpet settings as well as a bare setting so you always have the brushes positioned correctly, without worrying about damaging your floors or the machine. The Panasonic MC-CL945 Plush Pro provides excellent cleaning for a variety of surfaces. 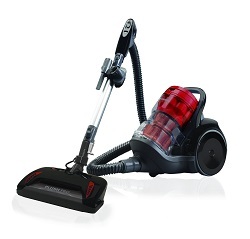 It’s is a nimble steering vacuum with enough onboard tools to handle anything you need to clean around your home. Plus, the HEPA filtration will remove all of those microscopic organisms from the air that you cannot see so your indoor environment is healthy. It’s a great choice for anyone looking for an affordable canister vacuum without spending an inordinate amount of money. To read more about it including online consumer reviews, click here to visit our highly recommended eCommerce store.